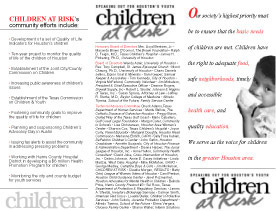 Brochure: 2-color, 11" x 8.5", folds to 3.7" x 8.5"
Children At Risk contacted me in 1997 and asked if I could design a brochure for them to promote their cause  improving the quality of life for the children of Houston through various community efforts. It was an easy thing to say "yes." One of the stipulations of the design was to keep the colors to a minimum to keep printing costs down. So we opted for a two color brochure that would print on an 8.5" x 11" sheet of paper. It would fold into thirds and include a coupon for a donation. 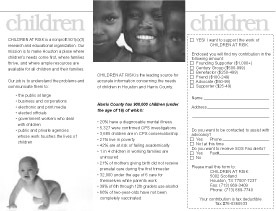 Click on the images at right to see a larger version of the brochure.